Polynesians settled Hawaii during the 400’s C.E. They came by double-hulled sailing canoe from the Marquesas Islands in the South Pacific. The trip probably took months, and survival required substantial supplies of food and fresh water. Even then death loomed for any canoe the gods didn’t favor with rain, fish, and good winds. It’s hard enough to imagine making the trip when you know the destination. But how did the Polynesians ever discover Hawaii in the first place? Hawaii isn’t on the way to or from anywhere else the ancient Polynesians traveled. In fact, it’s arguably the most isolated spot on Earth and lies more than 2,000 miles north of the Marquesas and the rest of the ancient Polynesian homeland in the South Pacific. Nor is it likely currents carried lost fishermen to Hawaii. Pacific currents wouldn’t have done the job. And the canoe would’ve carried a crew of skeletons by the time it washed up on Hawaii’s beaches, since fishermen don’t tend to carry months of food and fresh water. That means Hawaii’s discovers probably sailed into the unknown north on purpose, on a planned expedition. That sounds like madness if you’re simply relying on luck and your eyes to find new islands. It would have been madness for any of the more technologically advanced peoples of the 400’s, or of the next ten centuries. But the ancient Polynesians—despite living in a Stone Age society without writing, maps, or instruments—had a suite of island-finding techniques that let them see beyond the horizon. Birds: Migrating birds probably revealed that northern exploration might be worthwhile. The Bristle-thighed Curlew and the Pacific Golden Plover fly north from the South Pacific every year, suggesting land beyond the northern horizon. (And in fact both stop in Hawaii on their way to Alaska.) And birds probably served as radar once a voyage of discovery had begun. Shorebirds fly away from land in the morning and back in the afternoon, so sightings suggest the direction of land less than a day’s flight away. It’s even likely the explorers brought shorebirds with them and set them loose now and again. Like Noah’s dove, a bird that had found land nearby would not return. Wave Patterns & Debris: To most sailors on the open sea, a wave is a wave and says nothing about land beyond the horizon. But islands do impact wave patterns, and researchers think the Polynesian navigators could detect subtle changes in the waves and guess the direction of distant land. Floating debris suggests land too, particularly vegetation. Clouds: Clouds often catch a reflection of islands beneath them, and an expert navigator might see a telltale hue in distant clouds. The red glow of Hawaii’s fresh lava might have enhanced that effect, allowing sightings from even further off. Plus, clouds stack up over high mountains, like Hawaii’s Mauna Loa, suggesting an island to a sharp-eyed navigator, from more than a hundred miles away. Clouds may even have traced the pattern of warm and cold currents that form around Hawaii, creating another clue for sharp-eyed navigators. Other techniques probably played a role. We don’t know. We do know that the Polynesians saw more in the sea and sky than we do. In an age when the rest of humanity rarely sailed beyond sight of shore, the Stone Age Polynesian navigators had a global positioning system stored in their brains. Notes on the Discovery and Settlement of Polynesia, from Mālamalama / The Light of Knowledge: The Magazine of the University of Hawai’i, April 2011 — republished online by the The Polynesian Navigation Society. A Concise History of the Hawaiian Islands, by Dr. Phil Barnes (1999). Very interesting, as always, thank you! This is something I teach on and have written a whole section about in my forthcoming book “Languages of the World: An Introduction” (scheduled to come out from Cambridge University Press in January — check it out). The navigational techniques of the Polynesians are certainly quite amazing. Even to get to the French Polynesia (#5 on your map), they had to sail sometimes up to 12 days of point-to-point sail into the unknown. Not only is it incredible that they would set out in the first place, but how they did it is unbelievable too! Because the predominant currents and winds in this part of the Pacific would actually be FACING them! And you can’t sail dead against the wind (“in irons”), not even with a modern yacht, let alone the simpler rigging they had. So how could they do it? It remained a mystery for a very long time; actually Thor Heyerdahl even used this as an argument for Polynesia being settled from South America (his Kon-Tiki theory). 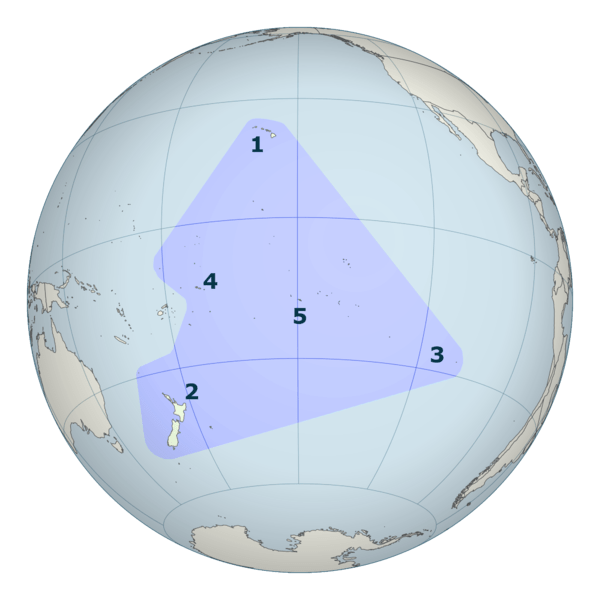 But as has only recently been discovered, the crucial word in the above puzzle is “predominant”: some time during the El-Nino years the winds and currents change, and the Polynesians must have figured it out and patiently waited until the right conditions to set sail in the easterly direction. If no land was found, as was probably the case on most trips, they would turn the sails when the predominant winds come back on again and just sail back home. Actually, sailing north (to Hawaii) or south (to New Zealand) was the easiest in terms of sailing, as it involves going at about 90 degrees to the wind (“beam reaching”). Another little corrections is that the Polynesian canoes don’t have enough space under the waterline to carry reserves of food and water to last months, as you say. Compare it to a European galleon… Thus, the Polynesians must have gone out on a lot of unsuccessful trips and returned home (or not, as the case might have been). Finally, it took me quite some time to figure out why navigation was so developed among these islanders. The reason is probably that navigation was crucially important to people who were dependent on it for getting from one island to another: in case of an epidemic or a natural disaster, it was the tribe’s navigator and he alone who could save them all. So these skilled navigators must have been next to God for Polynesians. To face the fierce and unpredictable reckoning of the open sea for weeks on end, the early Polynesians displayed incontestable courage – and profound literacy of nature, particularly the oceanic poetics you describe so well as “Stone Age GPS.” Amazing to think that when the first settlers arrived, the Hawaiian Islands offered little to sustain them, and these long-distance voyagers had to make repeated journeys to introduce the crops and animals that made this remote archipelago habitable. The discovery and settlement of Hawai’i is indeed one of humanity’s most heroic triumphs. The graphic you offer of the Polynesian World gives us an eye-popping sense of the breathtaking distances these intrepid navigators mastered with their “Stone Age GPS.” An inspiring post!